Gauge isn't all that important, but keep in mind that your hook and yarn choices should result in a fairly tight stitch so that the stuffing won't show through. NOTE: It's gonna be a little holey on the decreases from round 19-23 but it's alright since this is the front part that gonna be cover with felt and the lips. So the fiberfill wont show through or come out. Begin stuffing at this point if you haven't already. Stuff moderately firm while shaping as you go along. F/O, leave a tail for closing. Add any bits of stuffing needed to finish shaping the lips nicely. Weave tail through the final row and draw up tight to close. Secure and weave in ends. F/O, secure and weave in ends. At this point you can add 4 pipe cleaners inside the leave and glue them in place. Cut them to the desire length. The pipe cleaners will help bent the leaves nicely. F/O, secure and weave in ends. Flatten leaves and do not stuff. Fill the pipe with beans half way and the other half with fiberfill. Leave about half an inch not fill. The "soil" place it inside the pipe and sew the two pieces together with matching thread/yarn. The stem you want to put something sturdy inside. I put several pipe cleaners inside. The pipe cleaners will help the stem to bent in different directions. You want to place the stem right in the center of the "soil" and sew it in place with matching thread/yarn. The leaves, while we crochet them we put pipe cleaners inside. If you didn't, put some inside. Sew the leaves on both sides of them stem. You can bent your leaves whoever you want. Remember the decreasing part of the head goes in the front, we're going to cover it with felt. You can either glue the felt in place or sew it. See pictures below for placement of the felt and lips. Sew the pieces together with matching thread/yarn. Sew the stem in the center of the head, just like in the pictures. 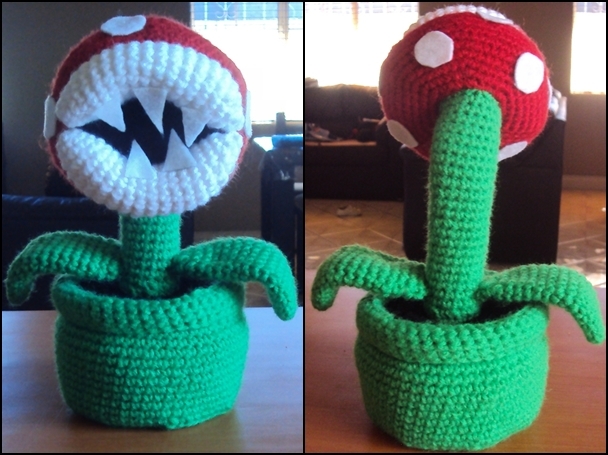 Once sewn you can bent the stem with the head. With white felt cut circles and glue them around the head. Cut small triangles for the teeth and glue them in place. Piranha Plant and Mario Brothers are copyright Nintendo. This pattern is an original pattern by Janet Carrillo "JC Designs" (October 2011). Please do not claim this pattern as your own. If you wish to share this pattern, you may link to this pattern but please do not reprint/repost it on your site. You may print and keep a copy for your own personal use but you may not sell or distribute it, or sell items may from this pattern. Omg!!! Can not wait to get started in this for hubbys X'mas present!! He's going to love it! I love it!!!! Are you supposed to join rounds? No, your not supposed to join the rounds. Just work on continuous rounds. This was amazing! I did make it, with some minor changes, for a coworker of mine! He loved it! I just crocheted the parts you used felt for.